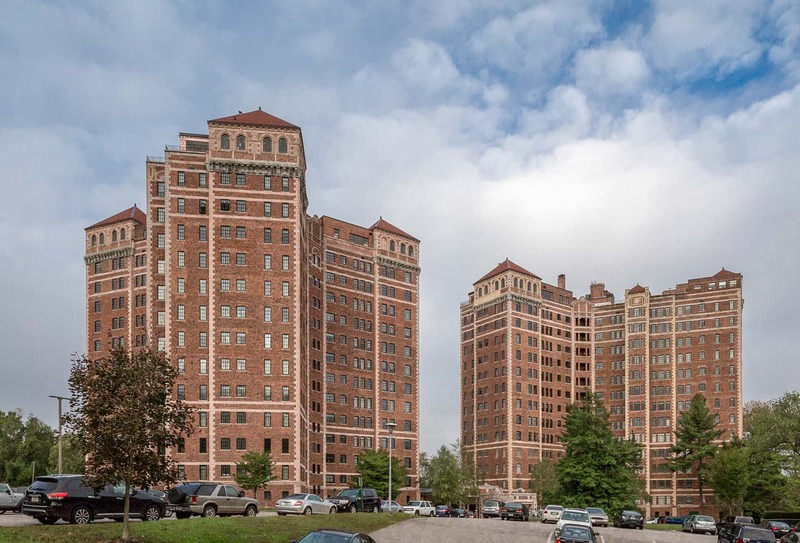 Alden Park is a complex of six high-rise apartment buildings – The Manor (three towers), the Kenilworth (two towers), and the Cambridge (one tower) – set on a verdant, 37-acre site in the East Falls neighborhood of Philadelphia. Built in stages between 1923 and 1928, the complex is a landmark in the English Renaissance Revival style popular in the United States in the early twentieth century. Beginning in 2015, our client undertook a massive, $70M renovation with the aim of restoring this beautiful, iconic property to its former grandeur. To that end, all 775 apartments were sensitively renovated, the building envelopes were secured, and new tenant amenity spaces, including an outdoor pool, were created. The single most challenging aspect of the project was the full replacement of close to 7,000 historic but highly deteriorated casement windows with thermally efficient aluminum units to match the originals.